Random Anny .Com: Varmeljushallare! Bless you. Holiday weekends are terrible for saling but hubby and I own a house now (!) and visits to the Habitat for Humanity store have become rote. Varmeljushallare! 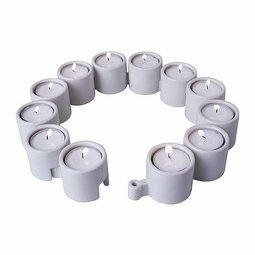 They are white porcelain, interlocking tea lights. I've thought about them on and off for years but they were discontinued and I think about too many things to start eBaying. These beauts were only $2! .25 for the small and .35 for the larger. Isn't cobalt blue such a pretty color? I am sharing at The Thrifty Groove cause I like to see what everyone else bought too! I bought a bunch of those tea light sets at Ikea five or so years ago. I gave them to many people but neglected to keep a set for myself! My two daughters in law both have a set and I enjoy seeing the different ways they use it! Those tea lights are such a fun find! and I love the cobalt blue dishes. Thank you for sharing at TTF!